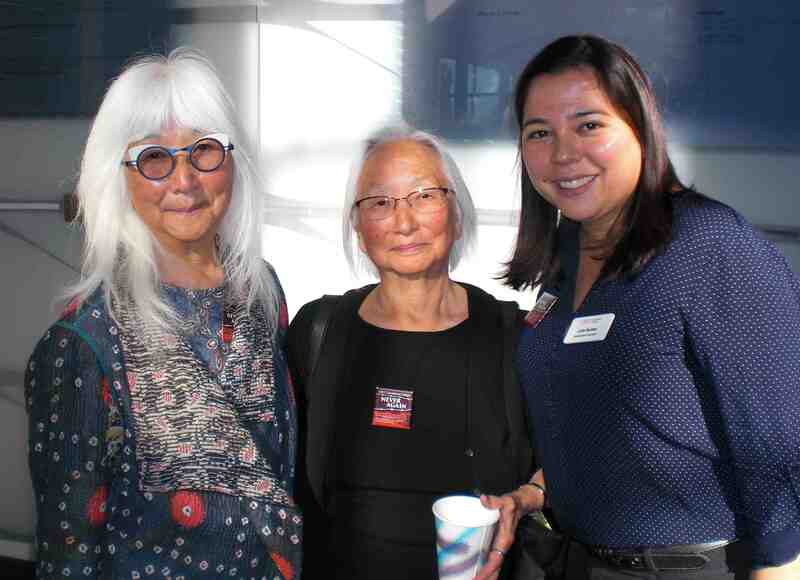 “Never Again,” a series of speakers, films, and exhibits to commemorate the 75th anniversary of the incarceration of Japanese Americans during World War II, kicked off at Occidental College on Feb. 12. That’s one week shy of the Feb. 19 anniversary of President Franklin D. Roosevelt’s signing of Executive Order 9066 in 1942, which led to the incarceration of more than 120,000 Japanese Americans – more than two-thirds of them U.S. citizens – in 10 hastily constructed camps in California and six other states. Bay Area filmmaker Emiko Omori began the series Feb. 12 with a screening of her short film “When Rabbit Left the Moon,” inspired by her own family’s incarceration in Arizona. Omori, who was a toddler when her family was forcibly relocated to Poston, and her older sister Chizu Omori answered questions after the screening. Los Angeles artist Clement Hanami, son of an atomic bomb survivor and a camp evacuee and art director at the Japanese American National Museum, spoke about his work on Feb. 21. His presentation was part of the Oxy Arts Speaker Series, funded by Occidental College’s Andrew W. Mellon Foundation Arts & Urban Life grant. “Never Again” also features an exhibit of materials drawn from Occidental’s extensive Japanese American relocation archival collection. In the days following the bombing of Pearl Harbor, Occidental President Remsen Bird launched a personal campaign to transfer Oxy’s Japanese American students to other colleges and keep them out of the camps. Beginning in January 1942, Bird began writing to colleagues and government officials across the country, attempting to establish “a proper centralizing of authority and approach” to facilitate the relocation of Japanese American students to colleges outside the newly established military zones on the West Coast. The efforts of Bird and many others led to the founding in May 1943 of the National Student Relocation Council (subsequently known as the National Japanese American Student Relocation Council). This fall, filmmaker Konrad Aderer will screen and discuss his documentary “Resistance at Tule Lake.” Tule Lake, the largest of the camps, was designated as a “segregation center” to house the 12,000 men, women, and children who were defined as “disloyals,” based on the infamous loyalty questionnaire by the War Relocation Authority. More information on the “Never Again” series can be found at www.oxy.edu/75th-anniversary-japanese-american-incarceration-never-again. “Never Again” is sponsored by the offices of the President; Academic Affairs and Dean of the College; Chief Diversity Officer; Religious and Spiritual Life; Community Engagement; Student Life; International Programs; Marketing and Communications; the departments of Art and Art History, Urban and Environmental Policy, History, Critical Theory & Social Justice, and East Asian Languages & Cultures; Center for Digital & Liberal Arts; Special Collections; Oxy Arts; and Advising Center.